It is that time of year when Club Membership needs to be renewed. Before doing so I wanted to clue you in on a few changes that are being made this year. 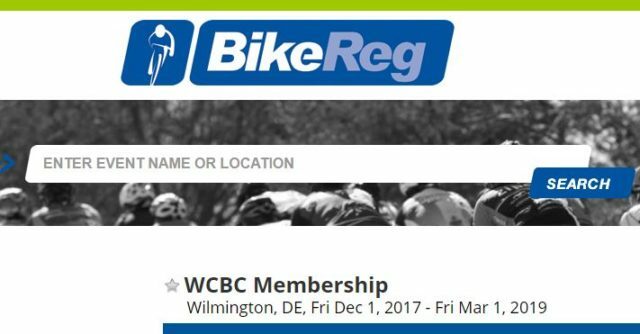 First – we are moving away from Active.com for our online membership registration and going with BikeReg.com. We were receiving complaints over the years from people when they accessed Active.com to register as members as well as register for our major events. We looked into our options and are in agreement that BikeReg.com will be better suited for our needs and provide us with flexibility to implement new options. When accessing BikeReg.com search WCBC for everything Club-related. Membership will continue to be from Match 1 thru February 28, and as of December 1 membership registration opened for new and renewing members. Those registering after December 1 will be members from December 1, 2017 thru February 28, 2019. Second – you will be assigned a WCBC Member Identification. In the past local bike shops offered discounts to Club members, with the proof of membership being the mailing label on the Tailwind which showed your membership expiration date. Since we no longer mail out a newsletter, we needed a way to identify members of the Club and BikeReg.com provides us with that feature. Third – we are exploring the possibility of offering discounts for the four major event (Icicle, Doublecross, Shorefire and Savage) to members in good standing. These discount will be offered during the online registration process thru BikeReg.com. Since we still looking into this, it will not be available for all events in 2018. More on this to follow as we work out the logistics with BikeReg.com. Fourth – we are moving exclusively to online registration for membership beginning this year. We will no longer accept mail-ins with payments of cash or check when joining or renewing membership. Each member must join or renew online to be assigned a member identification and to receive the confirmation email with this information. ← Message From the President – Where Does It Go?